On this occasion we would like to give you an idea of our Otavalo programmes, operated together with our partner in the Northern Andes, Mojanda Lodge. 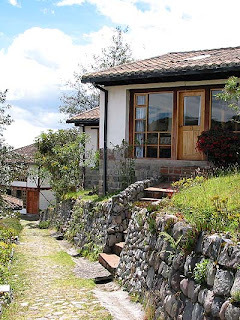 The lodge, located in Northern Ecuador at an altitude of 9,500ft, and three miles from the indigenous market town of Otavalo, is an ecologically oriented inn whose owners are deeply committed to principles of ecological and community-based tourism. Their commitment to the environment goes hand in hand with every effort to provide the most comfortable stay possible for visitors to this beautiful mountain retreat nestled in the Mojanda Lakes region. Mojanda Inn also works with local rural communities through its Mojanda Foundation, whose goal is to protect the cloud forest and wildlife throughout the region’s unique environment. The Foundation’s dedication to the communities can be seen in its educational programmes for the children of the Mojandita de Curuvi, a small village where half the children are indigenous, and where the Foundation has been sponsoring a kindergarten for the last ten years.